Thanks so much for all your helpful advice and info! I have a friend who lives in Barbados and was hoping the Zetas might give a bit more detail on the extent of sinking this and the other Caribbean islands might be facing in the next few weeks. As can be seen from plate tectonics, Central America is being pushed over the Cocos Plate. When this is done violently during the 7 of 10 roll, the crumbling we have described for these lands will occur. The small islands just to the east of Central America will participate in this crush. The Caribbean Plate will be pushed up behind them, bunched up, fracturing the rock layers so they go in all directions, up as well as down. This is an issue not so much of sinking as of unpredictability. The fate of these small islands is unpredictable. They may survive from the jumble, or disappear entirely. The hump of the S American Plate intrudes into the Caribbean, and as it moves to the west it will push the Caribbean Plate above Colombia down forcefully. The trend has already been noticed this past year along the Colombian coastline. Aruba, Bonaire, and Curacao ride on the hump, and thus will survive. 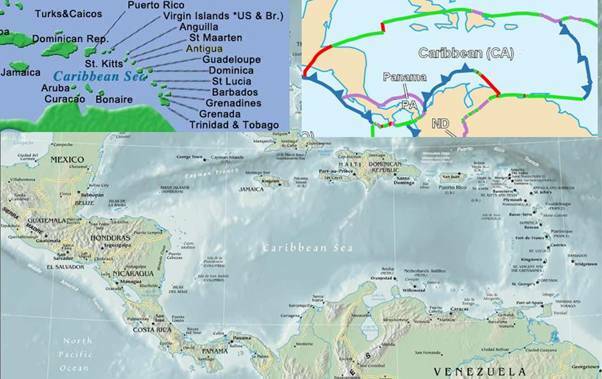 The island chain along the eastern edge of the Caribbean Plate was formed when the Caribbean Plate was pushed up during expansion of the Atlantic. But this is countered by the hump of S America pushing the Caribbean Plate down, overall. Thus those islands in the chain close to S America will lose in elevation, while those islands at the top of the chain will not. From Antigua south, the islands in this chain can expect a minimum of an elevation drop of 57 feet, on average, with this being irregular throughout due to the trauma to the area. Islands just to the north of S America will be affected the most such that Barbados to Tobago may sink entirely except for the highest points, losing several hundred feet in elevation, and Trinidad will be torn apart in addition to sinking as it rides on the plate border. A plate, being solid rock in layers, tends to move as one. Thus if the southern part is pushed down, it will tilt, the northern part lift up. The larger islands along the northern part of the Caribbean Plate could be assumed to gain elevation except that the entire Caribbean Plate is losing, overall. Thus the southern shores of these larger islands will experience some elevation loss, where beaches may emerge on the northern shores. To the extent that fracturing is occurring in the plate, as occurs for Haiti, fracturing can be expected. This will be a rough ride for all, with sloshing and clashing water and the Caribbean Plate which at first may seem to rise, then drop as the roll proceeds.